Our climate is subject to many potential tipping points, where a small change in human activity can lead to abrupt and significant changes in earth systems, with catastrophic and irreversible impacts. Feedback mechanisms that form part of the process could lead to runaway climate change over which we will have little or no control. dieback of the Amazon rainforest. This post considers the Amazon rainforest. Although clearing for cattle pastures is the main driver of Amazon deforestation, feed production for the beef, poultry, pig meat and other sectors is also a critical factor. The comparative emissions intensity of various food products is often considered when reviewing their climate change impacts. Emissions intensity is a measure of the amount of greenhouse gas emissions per unit of product, typically measured by weight. 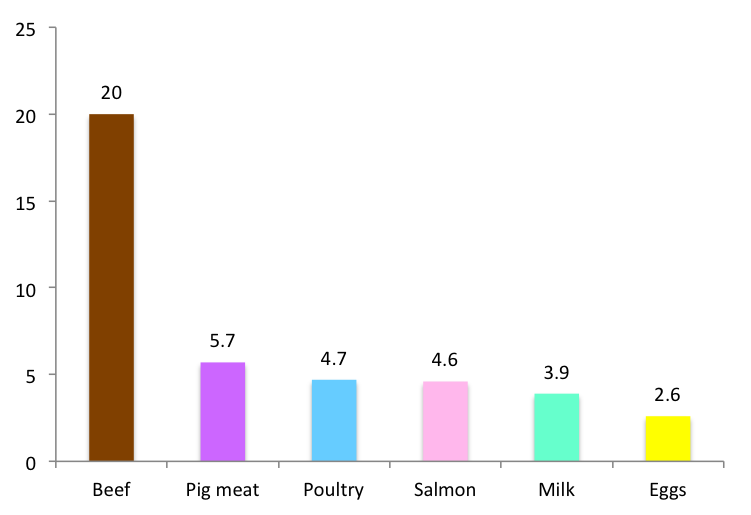 The emissions intensity of meat from ruminant animals, such as cows and sheep, is extremely high relative to most other food sources. Two key reasons are: methane emissions from the process of enteric fermentation in the animals’ digestive systems, releasing methane; and land clearing for pasture, releasing carbon dioxide. 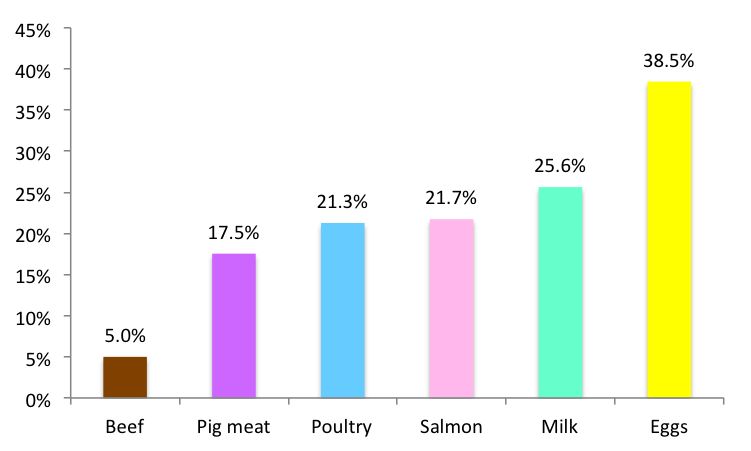 Although the emissions intensity figures of chicken and pig meat are multiples of most plant-based products, they represent a small fraction of beef’s figure. 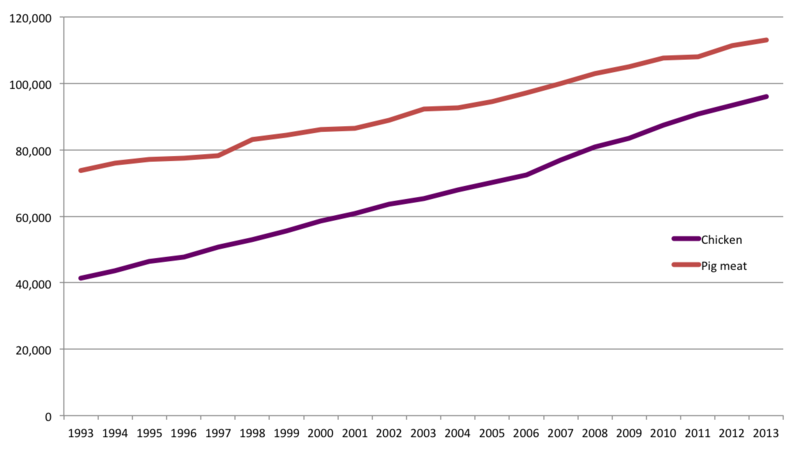 Accordingly, chicken and pig meat have generally received less attention than beef in the context of climate change. However, we are poised on the edge of a climate change precipice, where a relatively small step can mean disaster. Feed production for the chicken and pig meat industries has the potential to be that step, with reduced consumption potentially being an essential measure in our efforts to overcome climate change. When there is little or no buffer for avoiding catastrophe, all methods of doing so must be addressed. What is the problem with feed crops? The inverse figures show relative efficiency of animal-based food production systems in converting plant-based feed proteins. The inefficiencies mean that we require far more land and other resources than would be required if we utilised plant-based sources directly for our nutritional requirements. Although a cow raised for meat will generally eat far more grass than grain, the problem of extensive land use remains, with forests cleared for pasture, natural grasslands degraded, and carbon released from soil through erosion. Does this mean we can save the Amazon rainforest if we keep temperatures below that range? Much of the increase is coming from China, which produces 50 percent of the world’s pig meat (from a pig population of 482 million), and 20 percent of poultry meat (primarily from a chicken population of 4.835 billion). In 2006, various producers commenced a soy moratorium, whereby they committed to avoid trading soy from areas within the Amazon that had been cleared after 24th June that year. Brazil’s Ministry of the Environment joined the moratorium in 2009, and it has been endorsed by major retailers. Safeguards are supposedly strengthened by the fact that Brazil also has strong logging regulations, and requires large land owners in the Amazon to maintain at least 50 percent of their holdings in native forest. The moratorium is due to expire in May, 2016, by which time the industry argues that Brazil’s environmental governance will be robust enough to justify concluding it. However, there is strong evidence to the contrary, including a recent doubling in the rate of deforestation. There is a lack of enforcement and a climate of impunity. For example, only around 1 percent of fines imposed by the Brazilian Institute of Environment and Renewable Natural Resources (IBAMA) are collected. The agency is under-funded and under-staffed. The practice of timber laundering is widespread, whereby trees are illegally harvested and given clean documentation to facilitate their sale. There is a high degree of legal ambiguity in land title, which assists illegal deforestation operators seeking to avoid detection. Farmers routinely remove rainforest in order to plant crops such as rice and corn (which are not subject to the moratorium) for a short period, and then gradually change to soy. President Dilma Rousseff, despite pledging zero tolerance for deforestation, has aligned herself with the so-called ruralistic bloc, a coalition of wealthy farmers and agribusiness organisations that helped re-write land-use laws in their own favour. Rousseff appointed Katia Abreu, a former rancher and head of Brazil’s Confederation of Agriculture and Livestock, as minister for agriculture. Abreu has been nick-named the “chain saw queen” by environmentalists. She has complained that environmentalists and the indigenous population have been thwarting progress. Rousseff has also appointed Aldo Rebelo as the minister for science. He has said that talk of global warming is “scientism”, not science. He claims it is a tool used by Western imperialists to control poor nations. The Forest Code was introduced in 2012, which removed crucial aspects of rainforest protection and provided an amnesty for those who violated environmental laws prior to 2008. There is now an expectation of future amnesties for others who clear illegally. A new highway is planned to run from the city of Manaus through the heart of the Amazon to the so-called “arc of deforestation” in the south, which has been largely cleared for soy plantations. Roads provide access and act as a catalyst for further deforestation. The eventual completion of dozens of new dams (which represent a significant problem in their own right) and the Sao Luiz do Tapajos hydroelectric project will result in unemployed construction workers settling in the hinterland and clearing rainforest for farms. The problems are exacerbated by warming conditions arising from El Nino and the Atlantic Dipole. Whereas El Nino is caused by surface water warming in the Pacific Ocean, the Atlantic Dipole is a warm area of water in the North Atlantic, affecting south-western areas of the Amazon, including droughts in those areas in 2005 and 2010. Although China’s livestock sector is the major global consumer of traded soy products, consumption in any country contributes to the problem. In a country such as Australia, around 90 percent of the soy that is consumed is imported, mainly for intensive livestock feed. 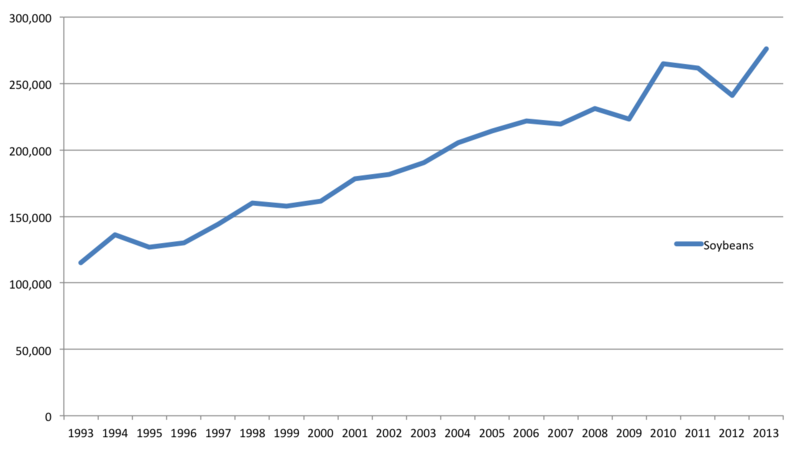 The trade is global, and any demand pressure contributes to an increase in overall supply. Conversely, reduced demand from one country may reduce production in any other country, including those not holding the initial supply contract. The reason is that production capacity may be freed in the initial supplier nation, enhancing its ability to compete for alternative markets that are being supplied by competitor nations. Accordingly, to the extent that livestock producers in a country such as Australia import soybeans from any nation, reduced Australian consumption can reduce soybean production in the Amazon. 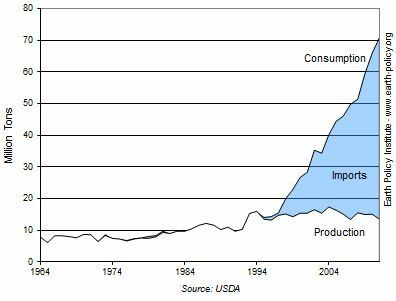 Reduced consumption of locally-produced soybeans by North American livestock producers can have the same effect. Faced with this frightening reality, Chinese authorities may accept that a continued increase in the rate of meat consumption, with its adverse climate change impacts, will be extremely detrimental to the nation’s future. Although this article has focused primarily on chicken products and pig meat, the problem is also relevant to the extent that soybean meal is used in other agricultural products, such as beef, dairy products, and farmed fish. All involve other serious environmental problems that are exacerbated by the inefficiencies and related scale of production involved. By any measure of sound economic or environmental management, such inefficiencies should not be perpetuated, yet a collective blind spot seems to apply in respect of animal agriculture. It is time to face the reality of our dire predicament in relation to climate change, and accept the need for urgent, meaningful action. Lenton, T.M. et al., op cit. Main image: Aerial view of Amazon deforestation in Brazil © Phototreat | iStock. Figure 5: Brown, L.R., op cit.